NBA Live 14 brings the basketball game series back to the court with impressive graphics, detailed player controls, and familiar EA Sports enhancements. Players get a wide range of experiences ranging from the extensive Dynasty levels to the special buzzbeater Moments (one is five seconds long). NBA Live 14 marks the first series installment since 2009’s NBA Live 10 for consoles (NBA Elite II released in 2010 on mobile). 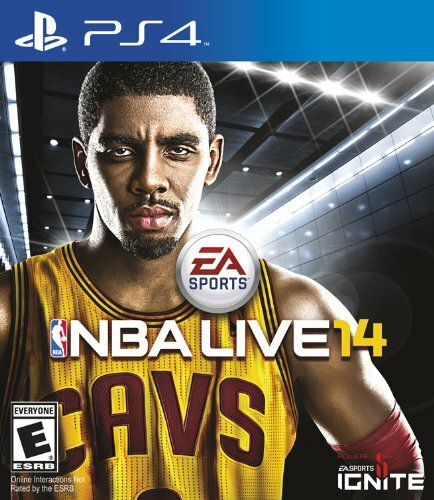 All-Star point guard Kyrie Irving (Cleveland Cavaliers) graces the cover this year for the PlayStation 4 and Xbox One versions. Developed by EA Tiburon and published by Electronic Arts, NBA Live 14 bounces on the next generation consoles after an overall three-year absence (NBA Elite 11 on mobile)…and four-year time out from consoles (NBA Live 10). It’s a step in the right direction. The following game modes dish up great variety: single player, multiplayer, Rising Star, Road to the Playoffs, Slam Dunk Challenge, and Ultimate Team. Staying connected means being well-connected so ensure that Internet connect is tip-top for these updates as well as online play against a worldwide cache of players. The CourtQ player performance connection to real players truly impresses, so players will want to stay connected to the NBA updates. The CourtQ features mirrors the real NBA for additional interest, which is easily achieved in-game thanks to constant real-time updates and statistics. Real players currently on a hot streak will reflect that performance in this game. The menu, statistics and overall presentation fits well. Just remember not to get too excited in the menus, especially when hitting the x button which cancels beginning actions. Players get great customization options in player creation and dynasty team. The customization works well except for a few issues. For example, playing as an all-star/mix team, my Ultimate Team (a great fantasy style experience) was expressed in text as LUT not ULT plus the announcers still refereed to my team as individual NBA teams. The Ultimate team play includes online head-to-head games and special showdowns where players can earn coins to purchase player and other object packs. In NBA Rewind players can replay an entire season while the great Big Moments (located on the menu bottom strip) offers even more replay variety ranging from a five-second buzzer beater to an extended clutch game experience usually focusing on one key player. Online play blends well with social media options through the EA SPORTS Hoops Net(work). Start a game with available friends or try competing worldwide against others. There is always an opportunity for challenges or solidifying playing/teambuilding skills. The most noticeable upgrade is naturally the visuals that impress and enhance the NBA simulation gameplay, which heightens all the action – good and bad. Players can really see if the moves they make really get penetration through defenses. In the beginning, you just try things out and watch the outcome. Minor glitches and sudden shifts are also there, but are largely minimal. Individual actions stress button combinations instead of one motion. Gone are the days of darting the direction button towards the basket and hitting your boost button. The rhythm-based BounceTek dribble combines with gathers, drives, and special moves, which can all combine into great scores instead of just pressing one button and the left stick towards the basket. Strategy plays a bigger part here, so players must know the controls inside and out to fully succeed. The movements still feel natural and incorporate the “gather” action much more, so players need to strategize their short-term moves as well as their overall game strategy (defense, substitutions, coaching options, etc.). Other enhancements include the halftime show, the best-of-seven Friends Finals series, improved fan animation, and commentary/analysis by Mike Breen, Jeff Van Gundy and Jalen Rose. The sound is excellent and the customizable music soundtrack from MICK includes 32 songs from artists like Big Sean, Diplo, Kat Dahlia, Kid Ink, Lorde, and Vic Mensa. A recommended (*** out of four stars) NBA gaming experience. This entry was posted in Video Game Reviews and tagged Michael Siebenaler, Mike Siebenaler, NBA, NBA Live, Tall Writer, video games. Bookmark the permalink.